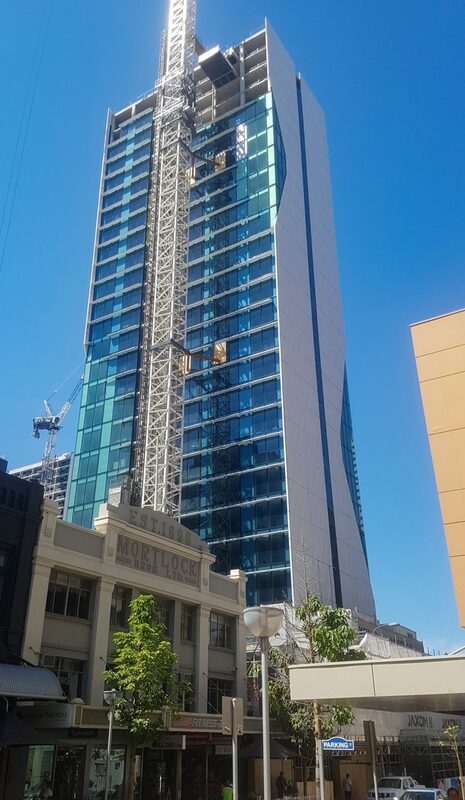 As part of the hotel construction boom in Perth’s CBD, Douglas Partners was engaged to provide geotechnical advice for a proposed 27 storeys hotel development together with a single level basement. The Mantra Hotel is located in the heart of Perth’s CBD (Hay Street), approximately 675 m northwest of Perth’s Elizabeth Quay, an exciting new waterfront precinct on the banks of the Swan River. Douglas Partners geotechnical specialists were engaged to undertake an investigation, which was divided into two stages owing to an existing commercial building across most of the site. Test locations were carefully selected during the Stage 1 investigation to overcome the abovementioned limitation and provide a reasonable testing coverage across the site, whilst achieving the objectives of the investigation in a cost-effective manner to our client 900 Hay Street Pty Ltd. The Stage 1 field investigation included the performance of cone penetration tests and boreholes, to provide continuous data within the soils for use in design of the proposed basement excavation retention and foundation systems. Several technically suitable types of foundation systems were suggested to our client, including a ridged raft, piled raft or a piled foundation system (contiguous flight auger piles, bored piles or barrettes), to achieve the financial and constructability objectives at this site. Geotechnical analyses and final element (FE) modelling using the computer software Plaxis 3D were undertaken by Douglas Partners’ Plaxis 3D experts, to further assess the suitability of the suggested ridged raft foundation system that was ultimately adopted for final design. Suitable types of ground retention systems for the proposed basement were also assessed. Following demolition of the existing double storey commercial building and during the initial stages of construction of the 27-storey building, Douglas Partners geotechnical specialists assisted the building company to undertake the Stage 2 geotechnical investigation, which included further deep cone penetration tests to refine the ground model and the design of the proposed basement excavation retention and foundation systems. Douglas Partners includes a specific hub of dedicated modelling experts that undertake advanced 3D modelling, for instance to assess the feasibility, the settlement response and the final design of complex foundation systems. A wealth of experience and specialist techniques in numerical modelling is available from this advanced modelling hub to provide designers, builders and developers with practical, workable and cost effective foundation system solutions.